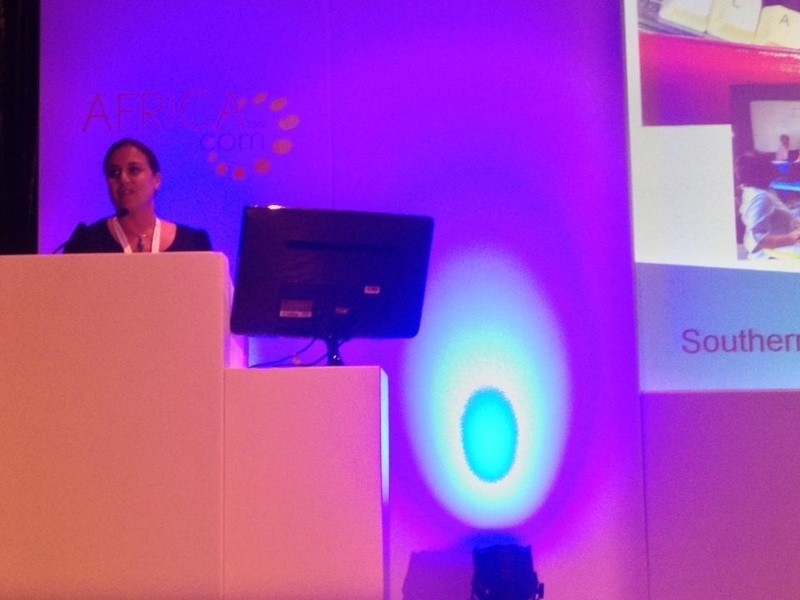 Last week, I attended and presented at Africa.Com, a conference in Cape Town which brought together the mobile and web tech community in Africa to discuss a wide range of issues. The conference had 8000 attendees and lots of break-out sessions, so I will be unable to summarise all the content, but I thought I would highlight some of the sessions and discussions which may be of most interest to our community. This blog post focuses on a fantastic session entitled ‘entrepreneurs innovation hub’. Mark Elias of Seed Engine opened the session, providing an overview of the various sources of capital available for entrepreneurs including innovative corporates, a young Angel network, accelerators, institutional grants, incubators, government grants and ‘friends, family and fools (FFF)’. He also contrasted the work of accelerators which tend to have set programmes, focusing on disruptive ideas at concept level and incubators which tend to support organisations which are already operational, with existing financials over a longer period of time. Mark showcased Seed Engine’s methodology of supporting innovative, disruptive ventures for 13 weeks providing seed capital, mentorship, coaching, equity in exchange and access to their Angel Network. He highlighted the importance of supporting both leadership and management, establishing strong partnerships and being able to communicate your idea clearly and concisely. Alan Knott-Craig Junior, Founder of World of Avatar gave a refreshingly honest account of his experience as an entrepreneur, highlighting the importance of staying true to yourself, taking risks and being willing to change your mind. He believes that both form and substance are important and that if you build something good, they [investors/users/partners] will come. He recommends proving an idea works as soon as possible-start and launch as soon as you can, get at least some money in the bank and then start showcasing your product to investors. I then participated in a lively panel discussion on the ‘Do’s and Don’ts of Start Ups’ with Kresten Buch, Founder of Human IPO, Tinus Neething of Rorotika , Johanna Kollar of Google and a World Bank representative. Issues discussed included projects needing a clear theory of change, ensuring the technology used is appropriate to the target audience (build for basic phones in rural areas for example), the need for techies and social activists to collaborate and the value of working with passionate individuals who are able to drive a project forward. Johanna highlighted the importance of access, content, local relevance and building sustainable communities and described the inspiring work of Umbono, a Google and 88mph accelerator programme in South Africa, whilst Kresten highlighted the importance of finding appropriate business models to enable mobile operators to provide discounted data through differentiated pricing and keeping operator costs low. Then it was my turn! I gave a presentation highlighting the role of innovation hubs in galvanising the local tech community and ensuring more and better projects were developed locally. Naturally, I showcased all the hubs we’re supporting and described some of the ways in which they are working towards sustainability, highlighting successful projects and giving an overview of the differences in local context, the work that still needs to be done and the crucial role of partnerships. I also described the role of Indigo in supporting both hubs and social tech projects. Anne Shongwe of Afroes brought some of the theory to live by describing how their programme had enabled them to develop a game called Champ Chase which helped their activists broach the subject of violence against children in township communities and has gained 185,000 mobile users and resulted in a 32% increase in Childline use. She highlighted the importance of co-creating content with the affected community, building sustainable communities and the need to establish partners to scale and replicate. She also explored different business models which could be adopted including sponsorships, brands, licensing, subscriptions and charging for data, but insisted that services should be free to the end user. Erik Hersman from iHub and Alexandra Fraser from The Silicon Cape Initiative then sat on a panel chaired by Justin Spratt from Quirk. Erik told the inspiring iHub story and highlighted the importance of being independent from government, citing KINU as a good example of success. He highlighted the importance of coaching hubs on how to connect with investors, marketing hubs and identifying income generating opportunities as well as tapping into incubators and encouraging collaboration between hubs. He shook things up a little by asking why there were so few black South African tech entrepreneurs and why so many applications focused on the Middle class. Alexandra highlighted how the Cape Savannah Initiative was working hard to create a more cohesive ecosystem. People questioned why South Africa was falling behind Kenya in this space and suggestions included its turbulent history, less hunger and drive among entrepreneurs who were often attracted into the corporate sector and less social projects arising as the industry is predominantly focused on commercial ventures. Overall the session showcased some of the tremendous potential of the tech start-up community in Africa as well as highlighting some of the challenges that remain. It was a fantastic atmosphere and I was delighted to be involved in such a lively and engaging session.